We’ve been in what I feel like is summer running in St. Paul since we hit our first 80+ degree days back in May. And the temperatures have only continued to rise. Even though I’m hot and sweaty on my runs right now, it’s one of my favorite seasons to run in. Here’s my favorite parts of summer running. My weekday runs have given me some gorgeous sunrises and summer is the only season where my 5 a.m. runs line up perfectly with them. It’s the most magical thing to head out and see the sun coming up and over the horizon as I run. This summer has introduced me to trail running and it is filling me with joy right now. 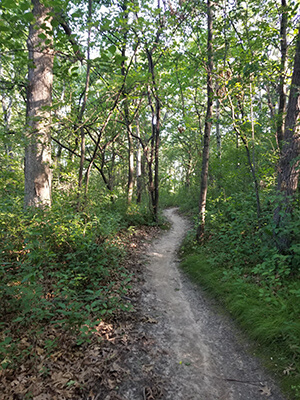 And because it’s summer, trail running means running through a forest full of green and it’s just the fulfilling part of my running right now. Trails are my happy place for running. Besides the sunrises and (somewhat) cooler temperatures, I just love running early in the morning because I feel so accomplished. When it’s 6 a.m. and I’ve already gotten a run in, I just feel more productive the rest of the day. Plus it’s so much quieter on early morning runs and I just have room to think. 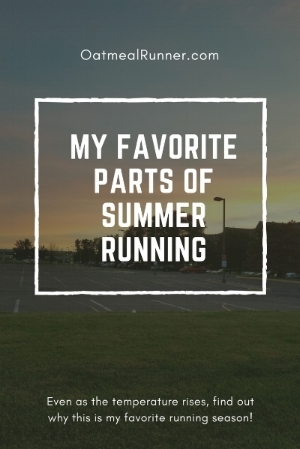 What are your favorite parts of summer running? Let me know in the comments! We are officially in summer and you might be seeing your paces slowing down like I am. Do not worry about it at all! 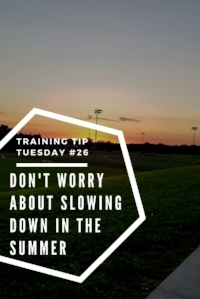 Even if you are training for a fall race, slower paces during the summer are nothing to worry about. Looking back at my past four years of running, I can see a pattern of slower paces during the summer and then once September/October comes around, my paces have picked up. It can be tough to see your paces slowing down in the summer but (for me at least) it’s to be expected. Temperatures and humidity rise during the summer months, making you work harder to hit the same paces. So it’s better for your body to slow down a little and wait for the cooler fall weather for your paces to pick back up. If you do need to do a key workout and hit specific paces, try getting out earlier in the morning if you don’t want to run on a treadmill. Check out the tips I use to get out for a run early in the morning if you need some help!